A crispy Flour tortilla rolled ‘n stuffed with Red Chile marinated Chicken Breast, Roasted Corn ‘n Black Bean salsa, Spanish rice, Monterey Jack & Cheddar cheeses; topped with a swirl of smokey Chipotle Aioli and served with Black Beans. Stuffed with Southwestern Shredded Beef, Black Beans and Monterey Jack ‘n Cheddar Cheese, deep-fried then topped with Taos Green Chile. Served with Spanish Rice, Guacamole and Sour Cream. A deep-fried Flour Tortilla filled with marinated Chicken Breast, Baby Spinach and Pepper Jack Cheese, then topped with Veggie Red Salsa. Served with Black Beans, Guacamole and Sour Cream. 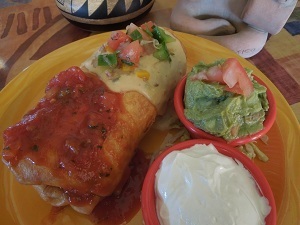 A deep-fried Burrito stuffed with “slow roasted” Smokey BBQ Pork, Roasted Corn ‘n Black Bean Salsa, Spanish Rice and Cheese, then topped with Chile con Queso. Served with Black Beans, Guacamole and Sour Cream.